At just 4” x 6”, this sturdy pocket guide is ideal to take on all your fiber jobs. 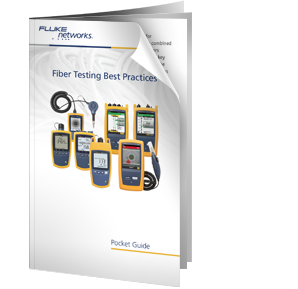 Including a quick-action summary and checklist, this guide is an invaluable tool to ensure you never miss a critical step during your fiber testing or troubleshooting. Note: This offer is limited to the United States and Canada. In other geographies, contact your local sales representative. Phone 800-283-5853 (US/Canada) or 425-446-4519 (other locations).